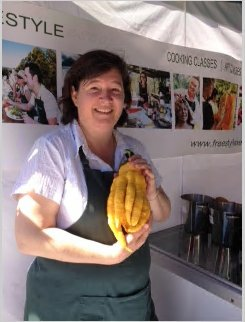 When I was at the Maleny Real Food Festival, Elizabeth brought in this Buddha’s Hand citron and gave it to my friend Martin Duncan from Freestyle Tout for display on his desserts stand. Isn’t it the strangest looking thing? Buddha’s Hand citron are a citrus but without much juice. They have been used by Asian people for room fragrance for centuries and yes they do smell quite beautiful! So, when I asked what do you do with them? Jutta shared her recipes for Limoncello liqueur. I just love this drink and plan to make my own with lemons. Click here for Juttas two recipes and start making your own liqueurs. Only use the very outer skin of the lemon (no pith). Grate or scrape it very finely. Place the lemon skin into a large container/bottle (also preserve the juice from 2 lemons. This can be frozen until such time when needed).Pour the vodka over the finely grated peel and seal so the alcohol will not evaporate. Strain the lemon rind from the liquid through a cheese cloth (it should have taken some colour on by now). Boil the water and sugar until the sugars is dissolved. Add the defrosted lemon juice and vodka. Give it a good shake and store in sterilized bottles in refrigerator or freezer. Should be served ice cold. Remove the yellow zest avoiding any pith with a citrus grater. Place zest in glass jar and add one bottle of vodka. Seal tightly and let stand for 30 days shaking often. ps of intensely flavored liquid from the peel. Add the second bottle of vodka.Boil the water and sugar until sugar is dissolved completely. Cool. For a cloudy limoncello, add the syrup while still slightly warm. Using the funnel, pour the liqueur into sterilized bottles, seal tightly and let rest at least one week. Additional aging will result in a smoother marriage of flavours.